One of my favourite indie series, and dystopian series overall is The Lux Guardians. The first book, The Forgotten, was one of the first books I ever reviewed on the blog (so forgive the no doubt terrible review I just linked! ), and I absolutely loved its sequel, The Wandering. I feel like I have been waiting for The Revelation for far too long, but I am excited to say that the day has finally come! 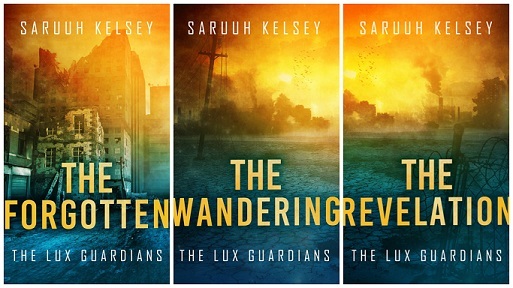 In order to celebrate her newest release, I asked The Lux Guardians author, Saruuh Kelsey, to write a guest post for the blog on writing and researching queer characters. I hope you enjoy it as much as I did! While I identify as queer, I don’t identify the same as most of the queer characters in my books. I have characters who are gay, bisexual, lesbian, and demisexual, and because I want to do my absolute best to avoid writing any bad and harmful representation, I do a whole lot of research for every book. A big part of my research is ongoing and daily, and that part is listening to queer people and being aware of the current issues the queer community is facing. Twitter is a great way to stay connected and in the loop, and its amazing for seeing a lot of people’s different opinions on a topic – instead of reading one article from one person’s point of view, you can see hundreds of people coming at it from their own, personal angle. But for each book I do research on top of this daily awareness, and that’s especially true for The Lux Guardians. For The Revelation, I read books written by and about queer people (my recent love is Queer, There, and Everywhere by Sarah Prager, a queer history book!) so I’d have a deeper understanding of each sexuality. Blogs from the queer community helped steer me away from most pervasive stereotypes, and the listening I do daily also means I know what should never find its way into my books. Seeing what books people have found problematic – and reading why that rep is harmful – is something I especially focus on, but reading about the experiences and hopes and fears of real people who identify the same way as my characters is the only thing that really helps me understand my queer characters and write them the best that I can. If you’re interested in checking out The Lux Guardians, I’ve got some handy Goodreads and purchase links for you below. I highly recommend starting this series because it’s unique, gripping, and incredibly diverse. And good news: The Forgotten is free! Also, check out these redesigned covers – I think they’re super eye-cathching. Thanks for sharing. This is a great topic, and it’s great to hear that the author is passionate about research and learning from people of various sexualities. Just because you identify on the spectrum doesn’t mean you know about all the other people on the spectrum. For example, I’m bi but people that are gay, transgender, lesbian, etc. have different opinions and experiences. I can’t claim to know them all. My pleasure! And you’re definitely right. The LGBTQIAP+ community is not a monolith and it’s great that authors are not buying into that kind of mindset! This is an awesome guest post! Thanks for sharing, Chiara. I think it’s fascinating to learn how authors are researching experiences which are not their own. I’m so glad this series you love has another book coming out! That must feel amazing. Saruuh: Twitter isn’t something I considered as a research source, but you have a great point about its value. How did you come to realize this? Also, I respect how you want to avoid misrepresentation. Have you ever had to combat charges of misrepresentation? If so, how have you fought it? I’m glad you liked it, Jackie! No problem :) I love learning about the different way authors write so I was more than happy to have this guest post on the blog :D I am super excited about the third book in this series! Awesome, awesome post. For all the flack twitter and social gets it’s such a wonderful way to understand the people and thinking out there in the world. Thanks, Verushka! I think Twitter is an amazing place to learn about different people’s lives. Love this post! Twitter has been so helpful to me in this respect, and also, I can’t WAIT to read Queer, There, and Everywhere.